I live at the north tip of Staten Island, near the Staten Island Ferry Terminal and up the hill, in The Wisteria, 141 St Marks Place, a 1929 building in historic St. George. You cannot take cars or motorcycles on the Staten Island Ferry. You can take unmotorized bicycles on all ferries. In this case go to B. 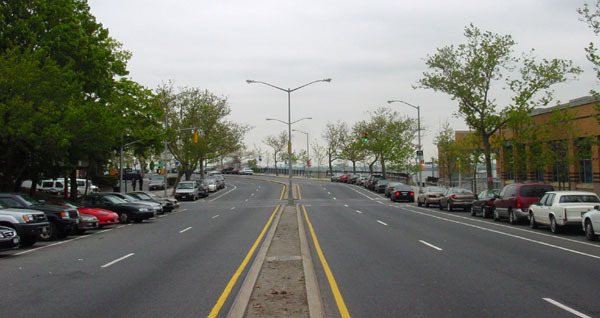 Else find the Staten Island Expressway, also known as I-278, from New Jersey on the east or Brooklyn on the west. 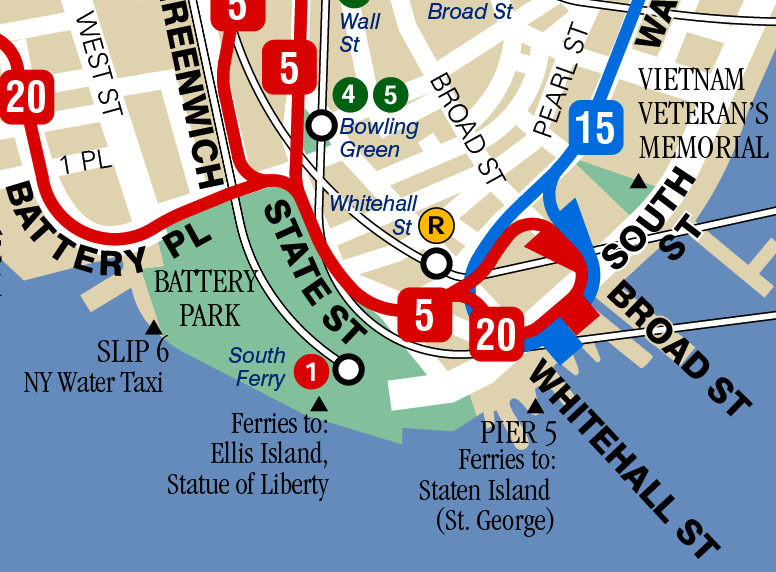 In either case, take the Staten Island exit nearest to the Verrazano Bridge, Bay Street. 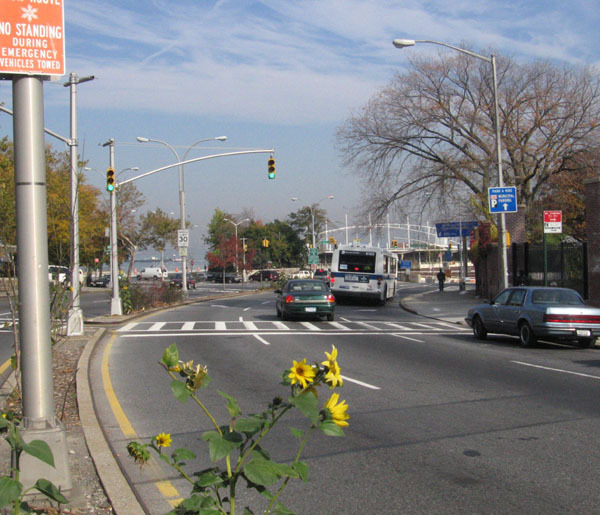 If coming from Brooklyn, follow the exit ramp onto the street, then continue for 2 blocks to a T-junction and traffic light. If coming from New Jersey, turn left at the light at the end of the exit loop, go under the freeway, then continue for 2 blocks to a T-junction and traffic light. In either case, turn left here onto Bay Street. On Bay Street you are going around Staten Island anti-clockwise, i.e., the water is on your right. Immediately before entering the Ferry Terminal, turn left at a traffic light, and you are on the continuation of Bay Street, which is Richmond Terrace. Now go to H: From Richmond Terrace near the Ferry Terminal. Find the taxi-stand for yellow New York City taxis. The taxis look like this. When you get to the head of the line, tell the dispatcher that you are going to Staten Island. You will pay what is on the meter plus the toll plus a tip. The meter should look like this -- particularly the RATE 1 on the right, which means Fare is entirely within New York City. The toll is for crossing the Verrazano Bridge. The toll will show on the meter and on the screen in the passenger area. Add your tip, which should be about 15% of the fare (if you are satisfied). The total should be a little less than $100. Ask the driver for the printed receipt. If the driver does not know the way, say Cross the Verrazano Bridge and then I'll guide you. Inside your terminal look for the AirTrain sign and the AirTrain exit. This is a driverless elevated train. 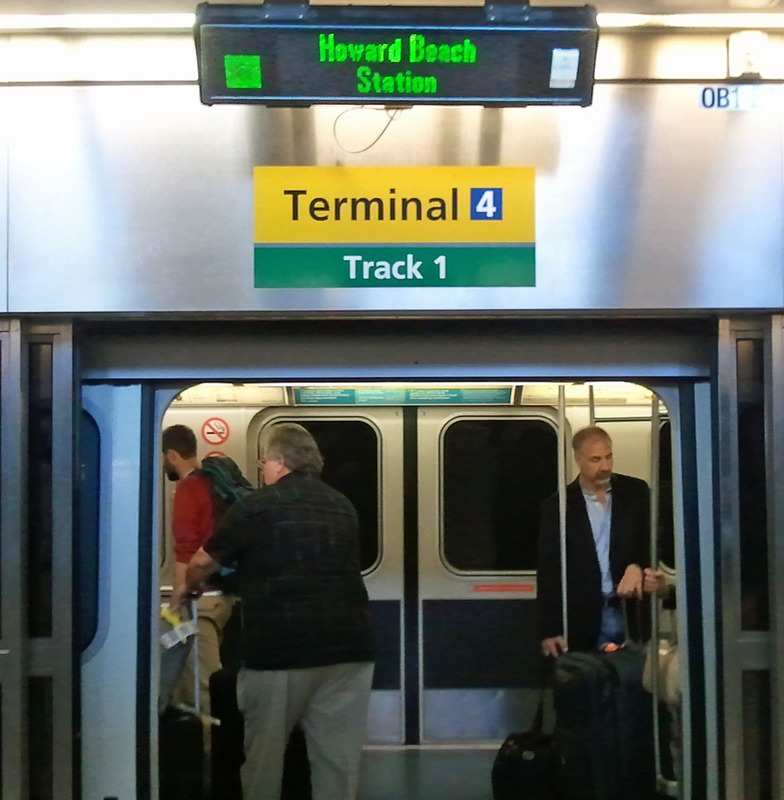 Take the Howard Beach train to its terminal at Howard Beach. 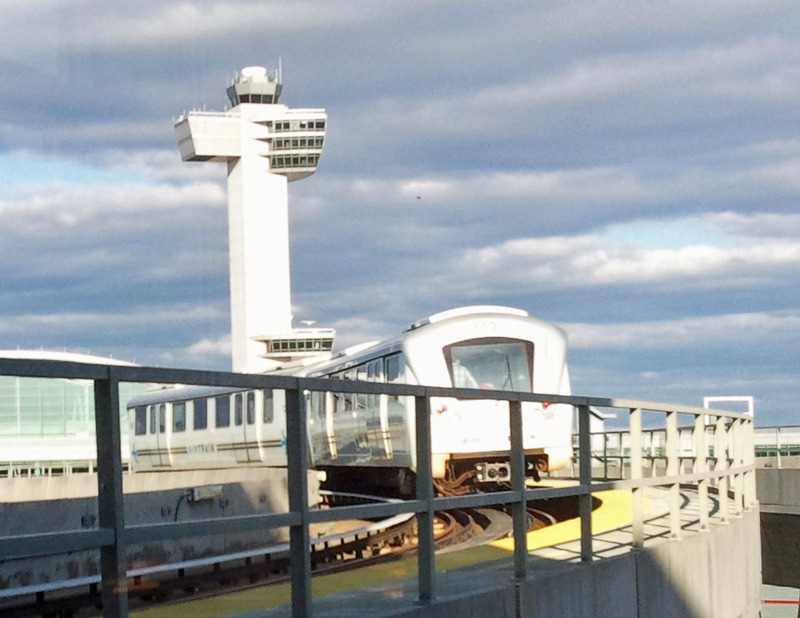 No charge to board the AirTrain. When you reach Howard Beach, walk out to the AirTrain lobby. 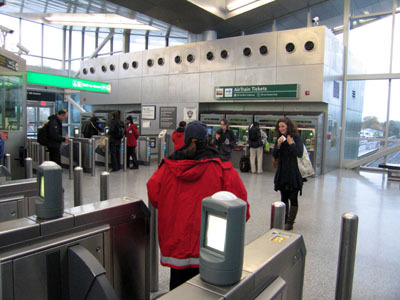 This area is fenced by turnstiles, and features red-coated helpers and MetroCard machines. 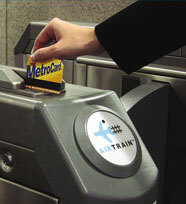 Use U.S. cash or a credit card to buy a Pay-Per-Ride (Regular) MetroCard for at least $8.50. 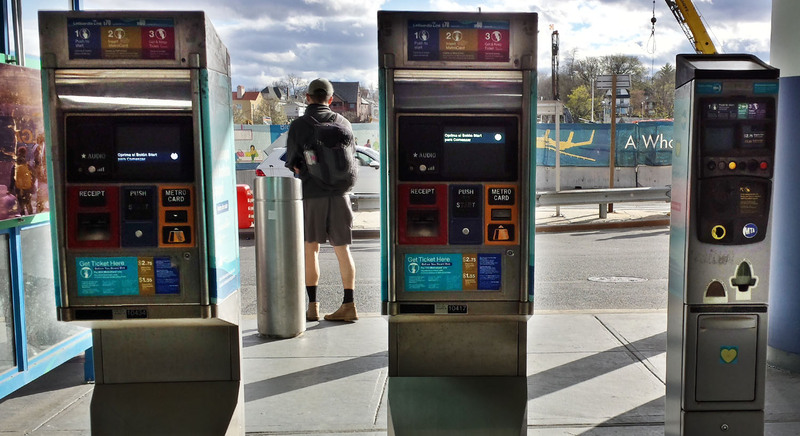 You will need $5 to pay for the AirTrain, $2.50 to pay for a subway ride and bus, and $1 for the MetroCard (which is reusable). 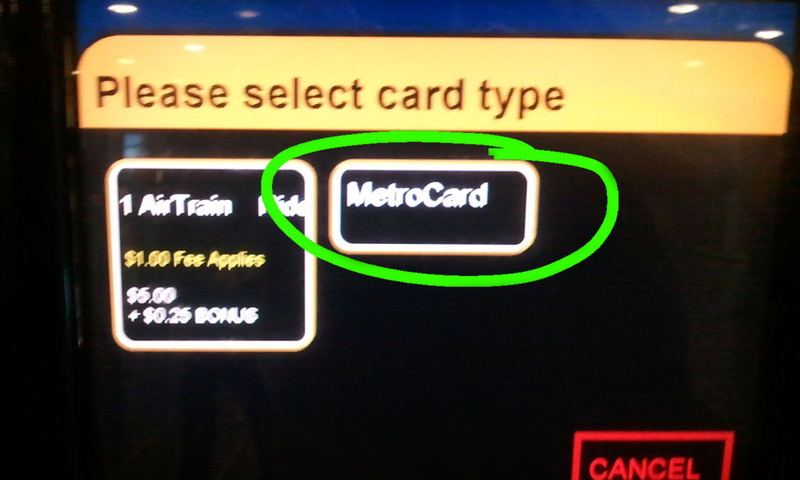 Buy a MetroCard for more money if you want extra rides on the subway and the buses while you are in town. Ask for help if you need it. Ask for a subway map. 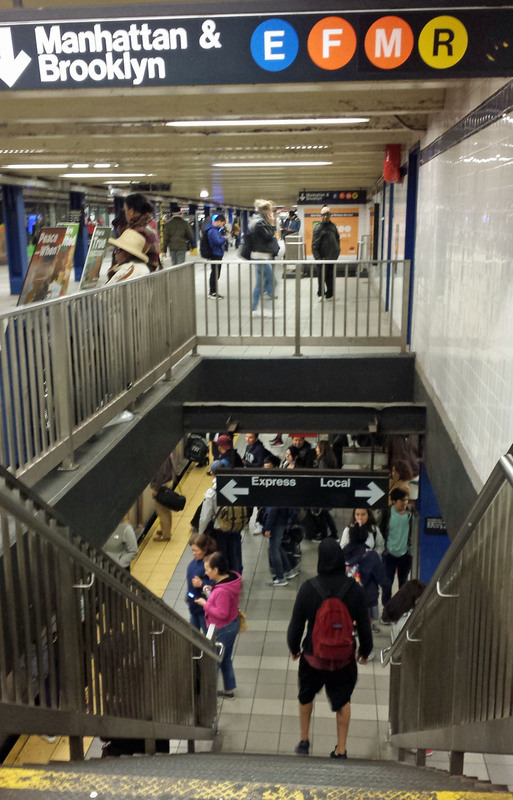 Swipe your MetroCard at the turnstiles on the left toward the Manhattan A train. Go down to the platform by the elevator or the escalator, and take the first train (A) that comes. The train runs an elevated route and then a long subway route. Get off the train at Jay Street - MetroTech. 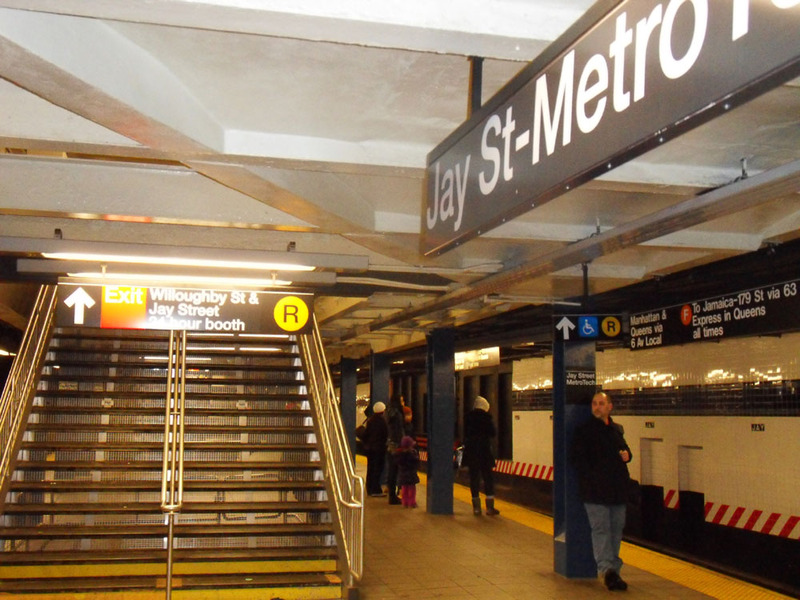 At Jay Street - MetroTech walk to the middle of the train and take the steps up marked with a black-on-yellow R.
Follow the black-on-yellow R transfer signs down to the R platform. 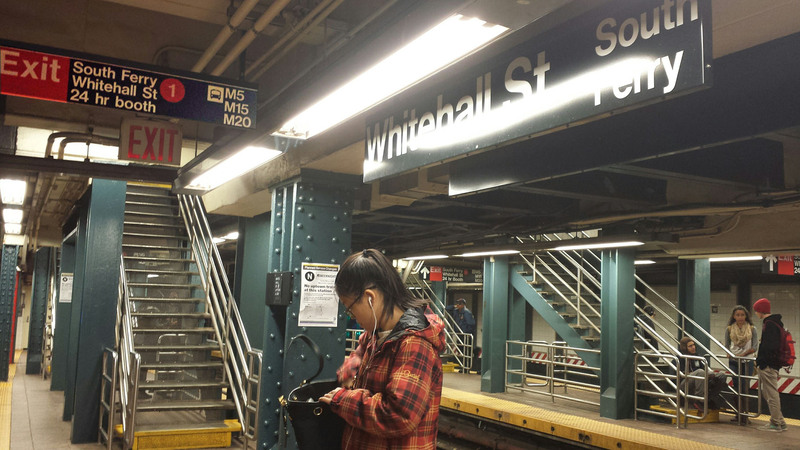 Take any train on the platform marked Manhattan & Queens R two stops to Whitehall St - South Ferry. 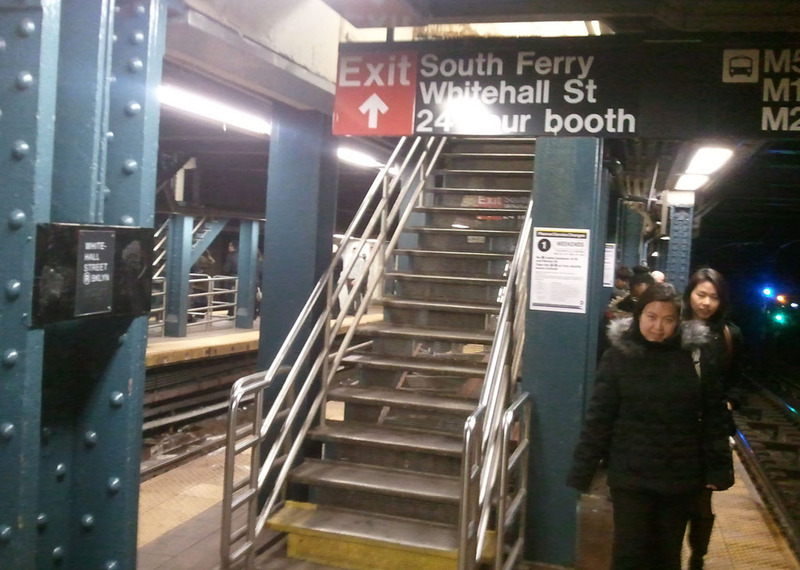 At Whitehall St - South Ferry walk to the back of the train and take the steps up marked South Ferry / Whitehall St. 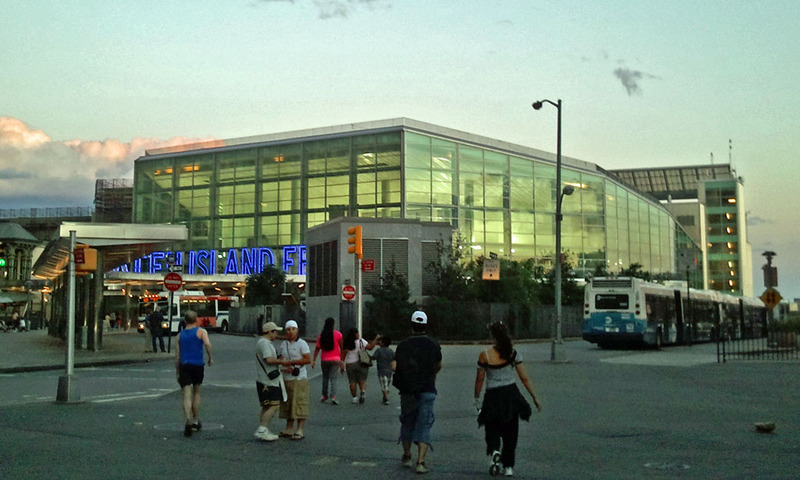 Climb one set of stairs, two escalators, and exit in front of the doors of the Staten Island Ferry Terminal. Enter the Ferry Terminal. Use the escalator or elevator. Take the ferry. 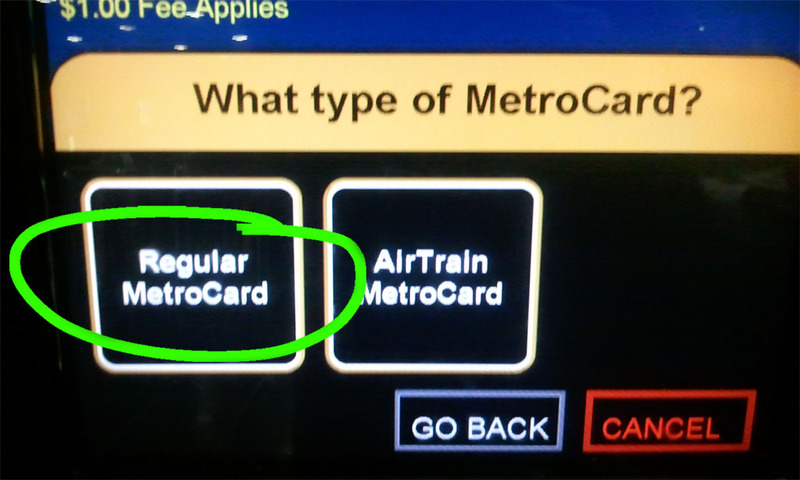 First, you will need a MetroCard. Look for a MetroCard dispensing machine. 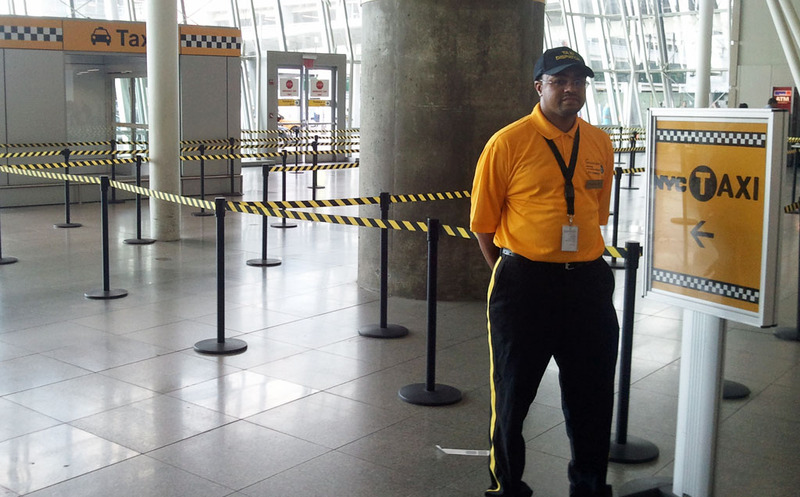 If in doubt, ask at the Ground Transportation Desk. 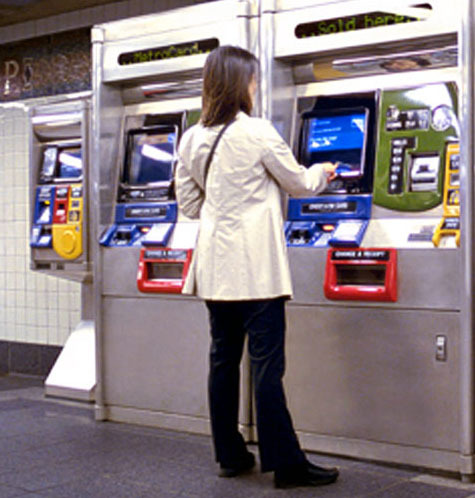 Buy a Pay-Per-Ride (Regular) MetroCard for at least $5.00 plus $1 for the reusable MetroCard, or a 7-day Unlimited Ride MetroCard, with a credit or debit card. 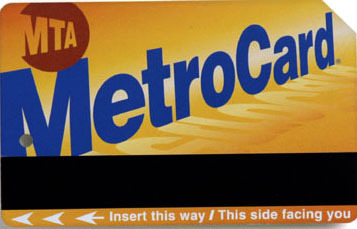 If you only have cash, ask for a MetroCard at the newsstand. Next you will need a ticket for the Q70 Select Bus. Get your ticket at a machine like this. 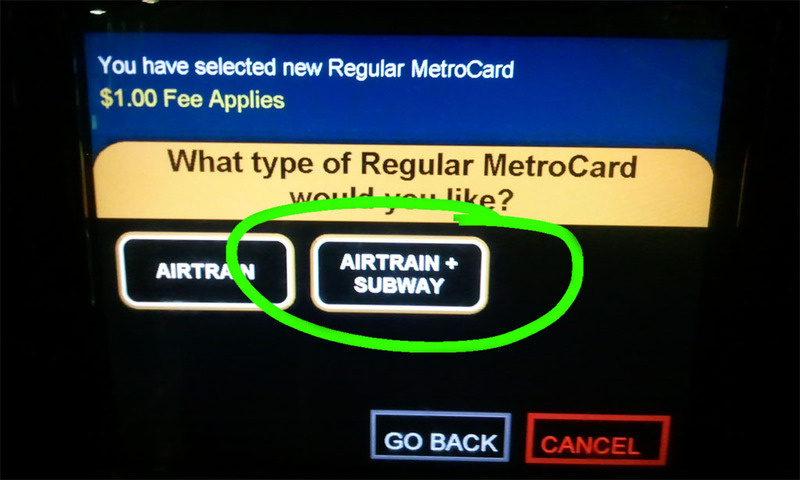 Press the button, use your MetroCard, take your paper ticket, keep it until you get off the bus. 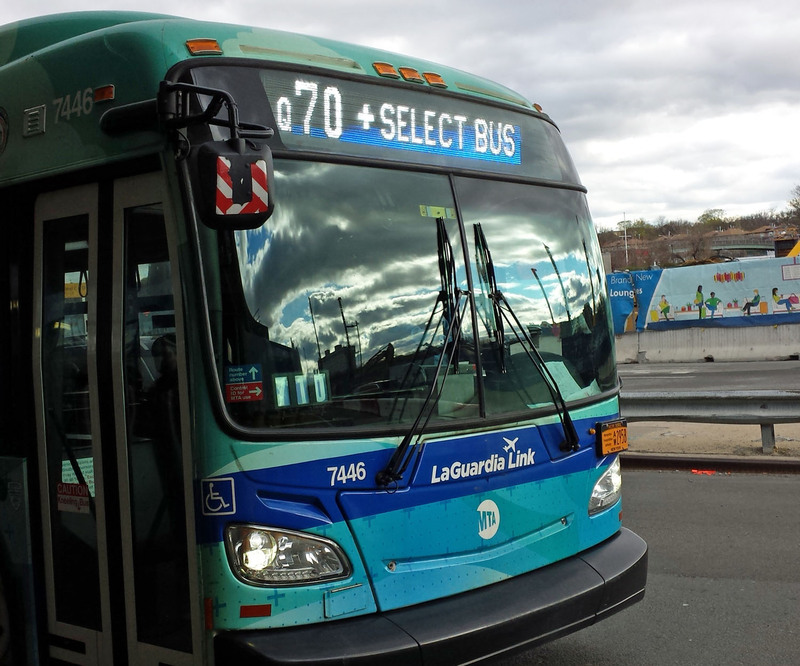 Look for the Public Bus stop and take the Q70 MTA LaGuardia Link Bus. 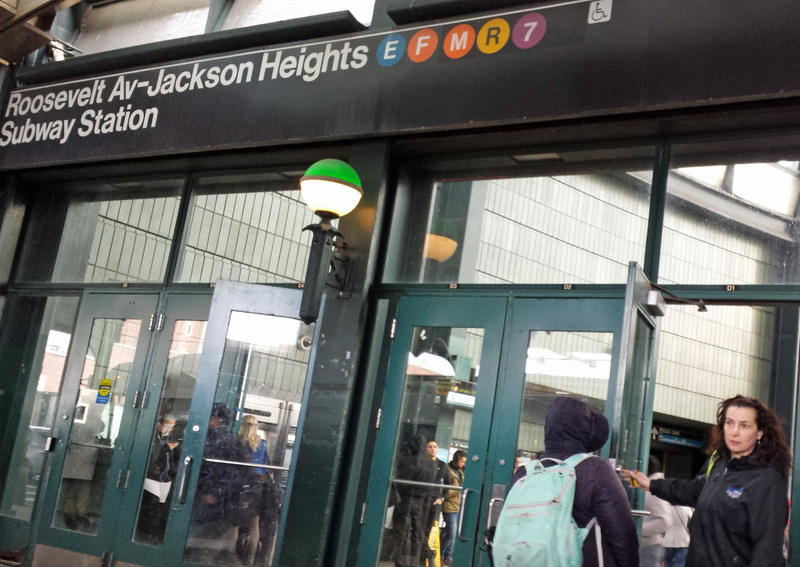 Get off at the Roosevelt Av - Jackson Heights subway station, the first stop after you leave the airport. 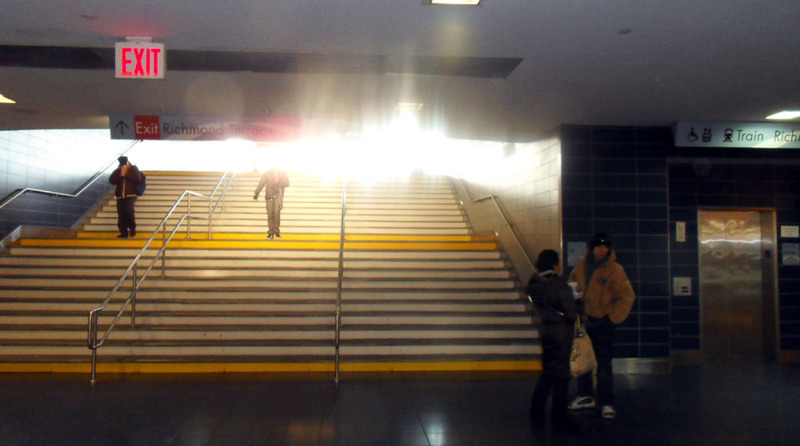 Enter the Roosevelt Av - Jackson Heights subway station. At the station ask the person in the booth for The Map of the subways (free). 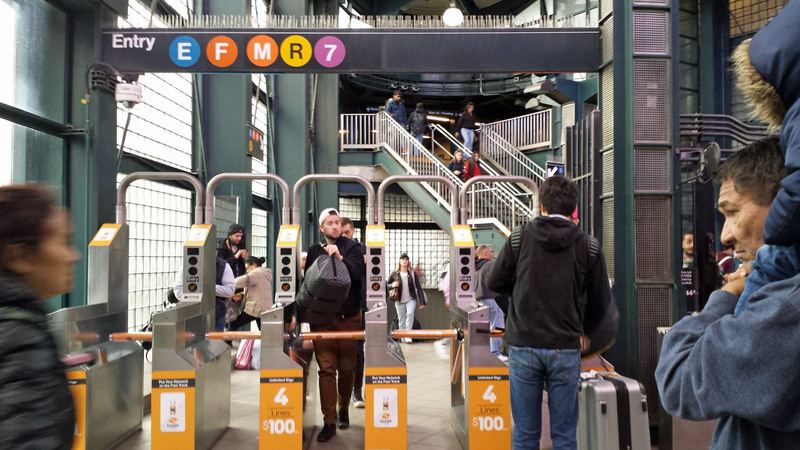 Enter the turnstiles with your Metrocard. Go down two sets of stairs to the Mezzanine (or use elevators). You are heading to the Manhattan-bound R train. 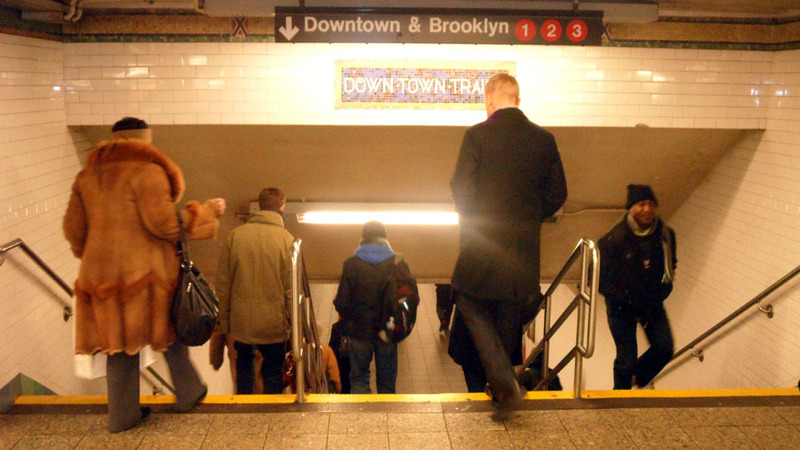 Go down one more set of stairs, to the Manhattan-bound R train (or use the elevator). The train will be on the Local track. Get off at the Whitehall St. South Ferry station. Take the exit at the front of the train. 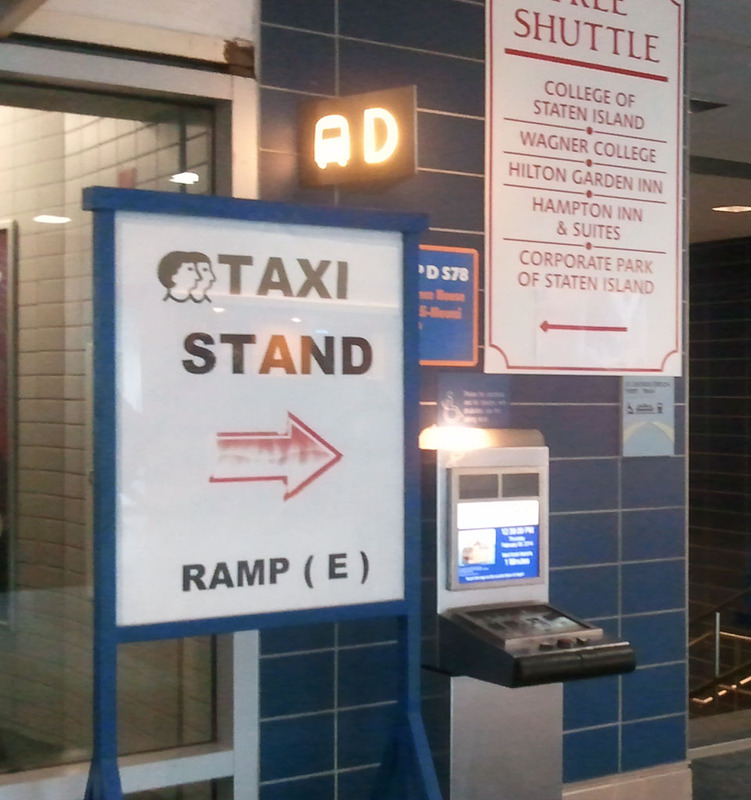 Exit the terminal toward the TAXIS sign and find the taxi-stand which looks something like this (depending on which terminal you are at). The dispatcher will quote you a price, hand you a ticket, and direct you to a taxi, which will be either a Newark or an Elizabeth taxi. You will pay what the dispatcher quoted you plus the toll plus a tip. The toll is $13 for crossing the Goethals Bridge (pay only one way), plus about $1 for the New Jersey Turnpike. The tip should be about 15% of the fare (if you are satisfied). The total should be less than $70. If the driver does not know the way or does not have a GPS, say Cross the Goethals Bridge and then I'll guide you. 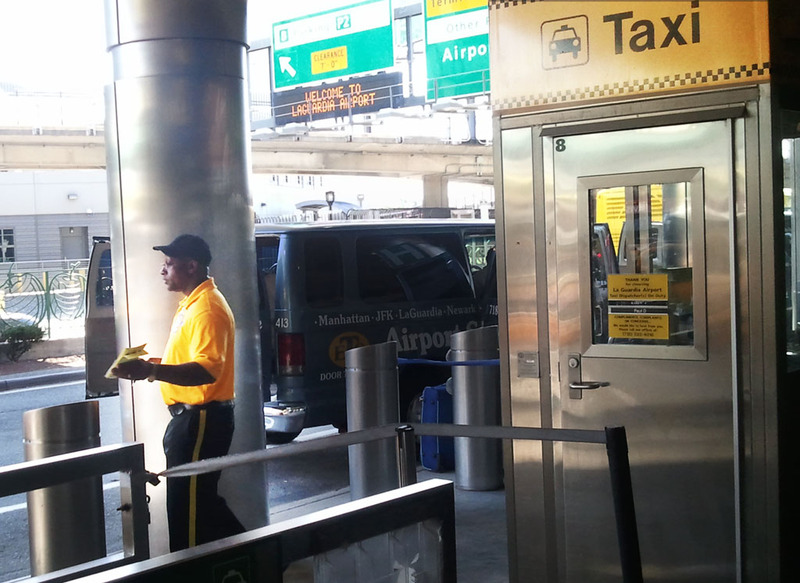 Newark Liberty Airport (EWR) is the closest international airport, but unfortunately the journey by public transportation involves going north and east to Manhattan, and then south to Staten Island. 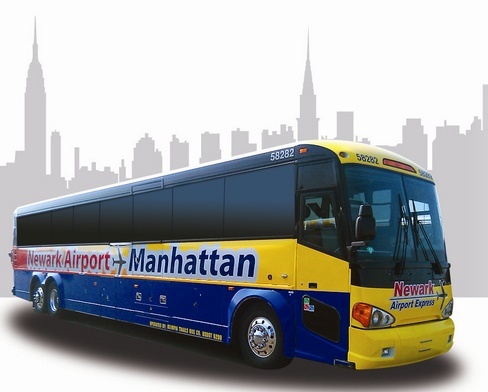 Take the Newark Airport Express to the Port Authority Bus Terminal in Manhattan, New York City. Exit the terminal and wait at the Newark Airport Express sign. The bus looks like this. Pay $16 to the driver. 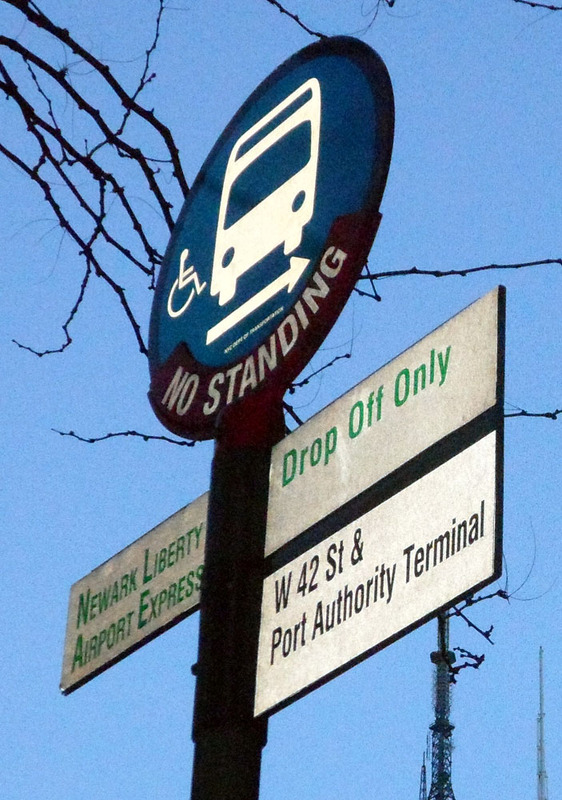 After leaving the airport (the bus may stop at several terminals), get off at the 1st stop, the Port Authority Bus Terminal (PABT). The drop-off is on 42nd Street between 8th and 9th Avenue. 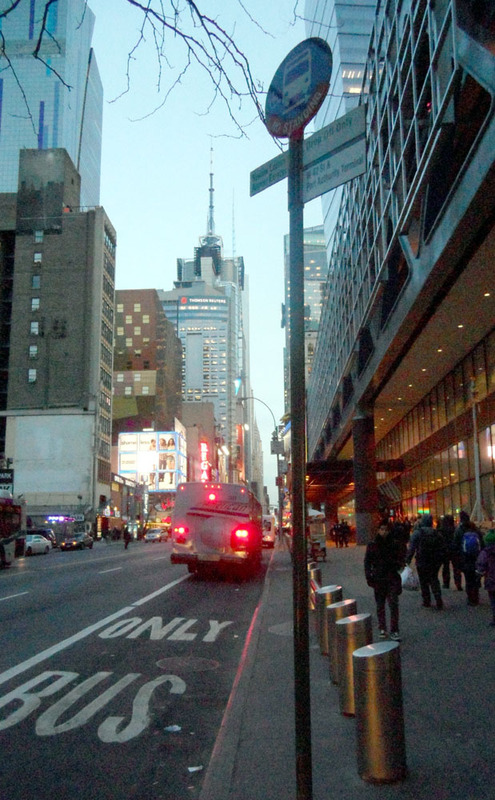 Walk forward (east) on 42nd St, crossing at the lights, and then 1 block to the Times Square subway station. At the bottom of the steps buy a MetroCard at a machine like these. 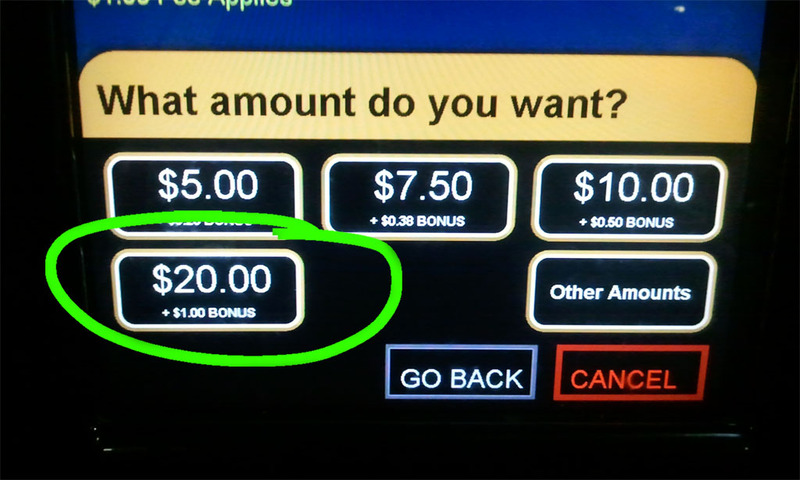 Buy one ride for $2.75, or mulitple rides at $2.50 each (plus $1 for the reusable MetroCard). 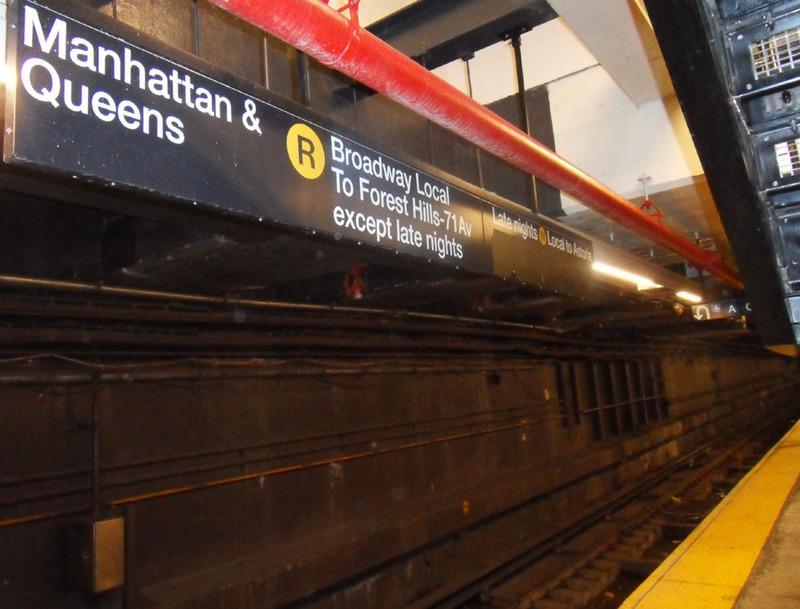 Take the Downtown & Brooklyn 1 train to South Ferry (end of the line). Board the front half of the train (first 5 cars, in front of the conductor). Take the exit at the very front of the train and exit through the turnstile. 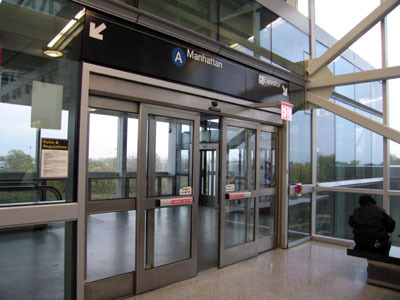 Then take the escalator up and exit in front of the doors of the Staten Island Ferry Terminal. Enter the Ferry Terminal. Use the stairs, escalator, or elevator. Take the ferry. Note on bicycles: You can take unmotorized bicycles on the subway and the ferry, but not on the bus. You can also take foldable bicycles on the bus. 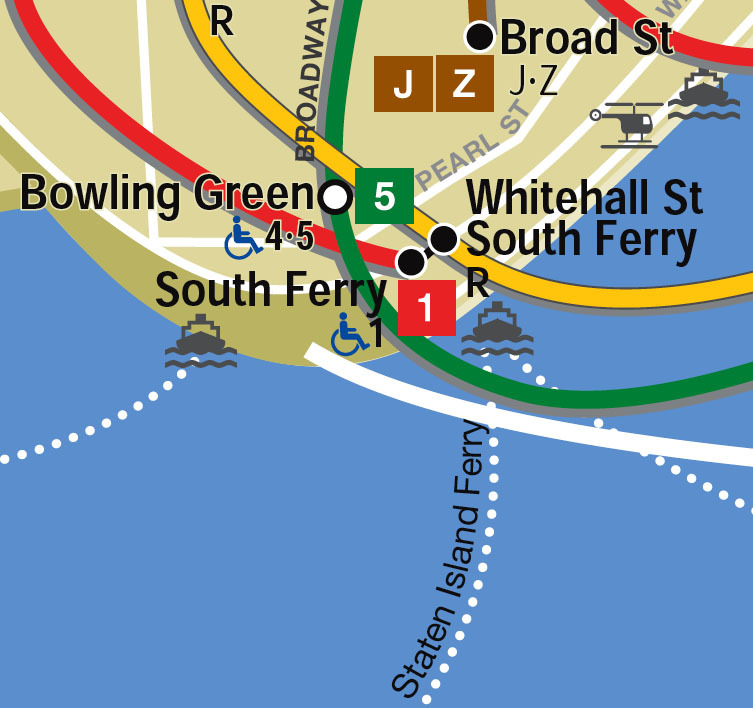 Find the Staten Island Ferry Terminal at the southern tip of Manhattan (South Ferry or Battery Park). 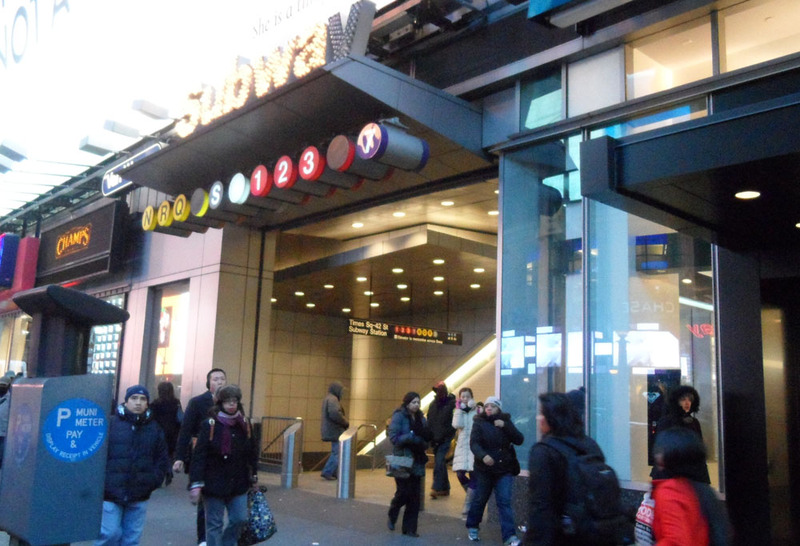 The 1 subway to South Ferry. Board the front half of the train (first 5 cars, in front of the conductor). 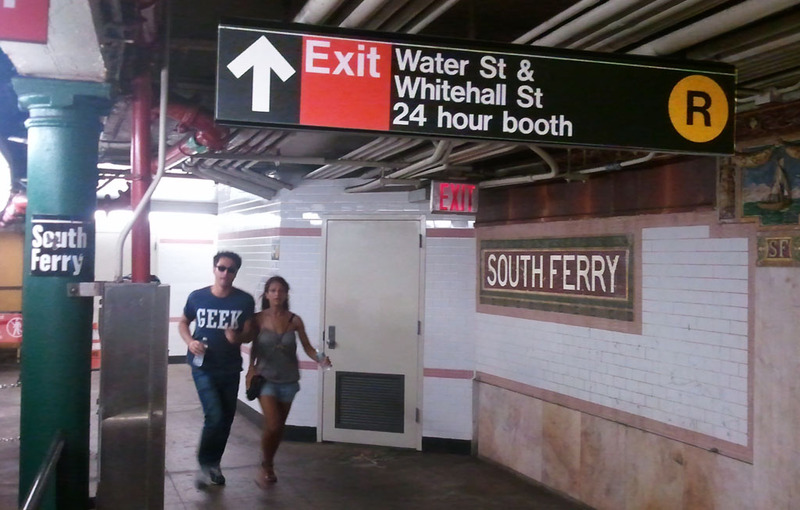 The R subway to Whitehall St - South Ferry. 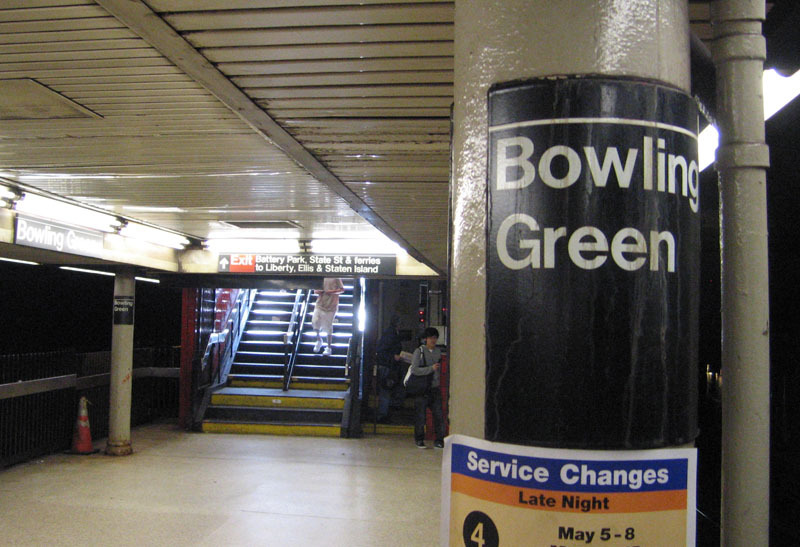 The 4 or 5 subway to Bowling Green. Exit the platform at the front of the downtown train. Take the steps up marked South Ferry / Whitehall St, climb one stairs, two escalators, and exit in front of the doors of the Staten Island Ferry Terminal. Take the exit (there is only one on each platform). 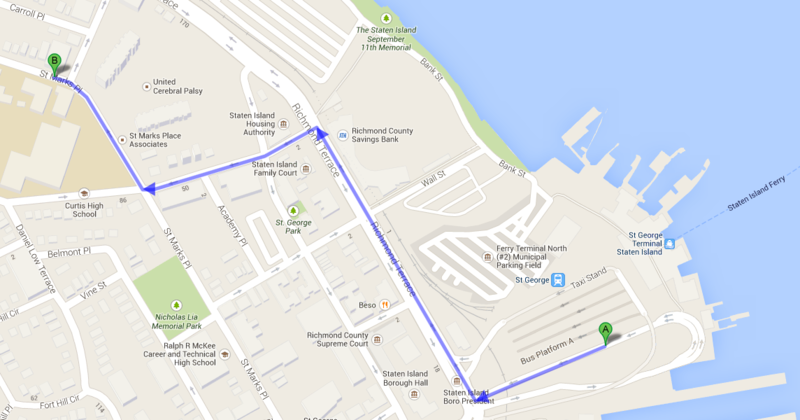 Now walk two blocks downtown, i.e., south, to the Ferry Terminal. 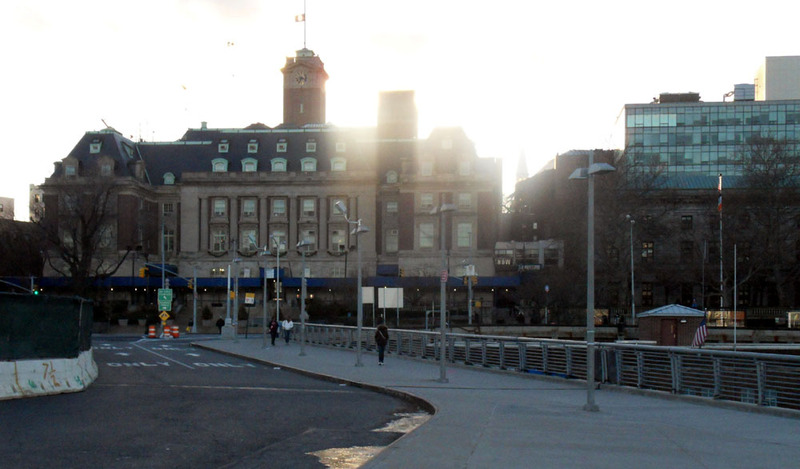 Take the M5, M15, or M20 bus to the last stop at South Ferry. 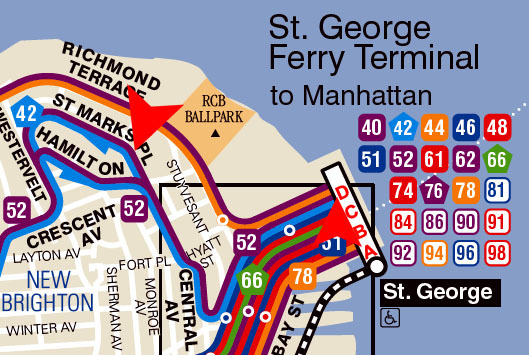 The Ferry Terminal is within a block of the last stop. For any of these, buy a MetroCard at any subway station or some newsstands. The ferry schedule is at http://www.nyc.gov/html/dot/downloads/pdf/siferrysched07.pdf, or call the City of New York, within New York City call 311, or outside New York City call +1-212-639-9675. In general the ferry runs twice an hour, on the hour and the half hour; in rush hours more often; late nights once an hour on the half hour. The ferry crossing takes about 20 minutes. Admire the view. Now go to C: From the Ferry Terminal in Staten Island. On the Staten Island side, this (B) is where you want to get to. See Google map at http://goo.gl/maps/ZQDqV. 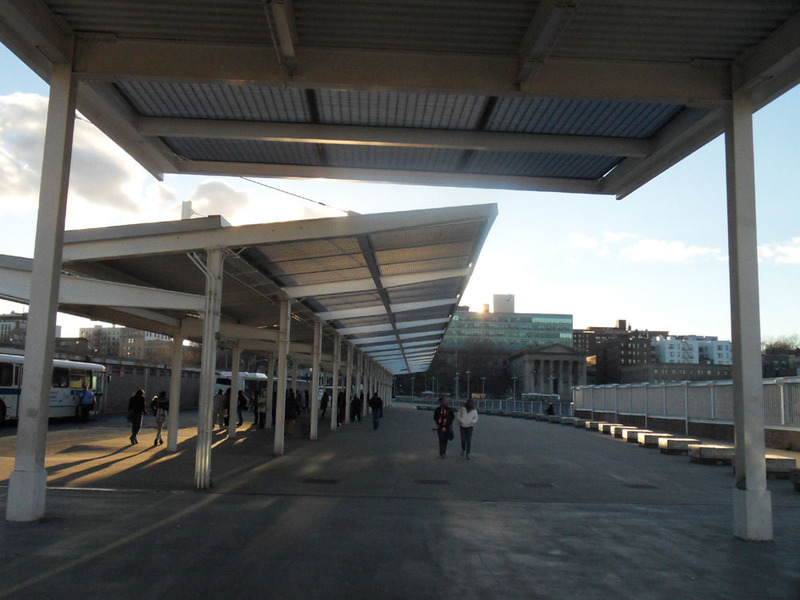 At the Ferry Terminal on the Staten Island side, get off on the upper deck, and follow the crowd. You will walk either left or right around the central waiting room, and then find yourself in a long hall with stairs down to trains and ramps up to buses and taxis. 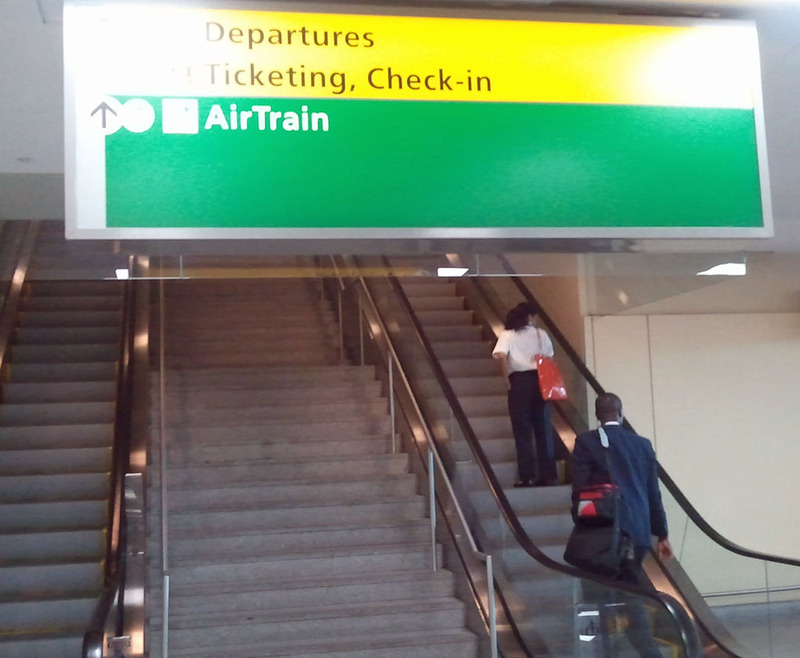 The stairs to the taxi rank at Ramp E are toward the right of the hall. Go up these stairs to Ramp E.
There is an elevator further to the right. 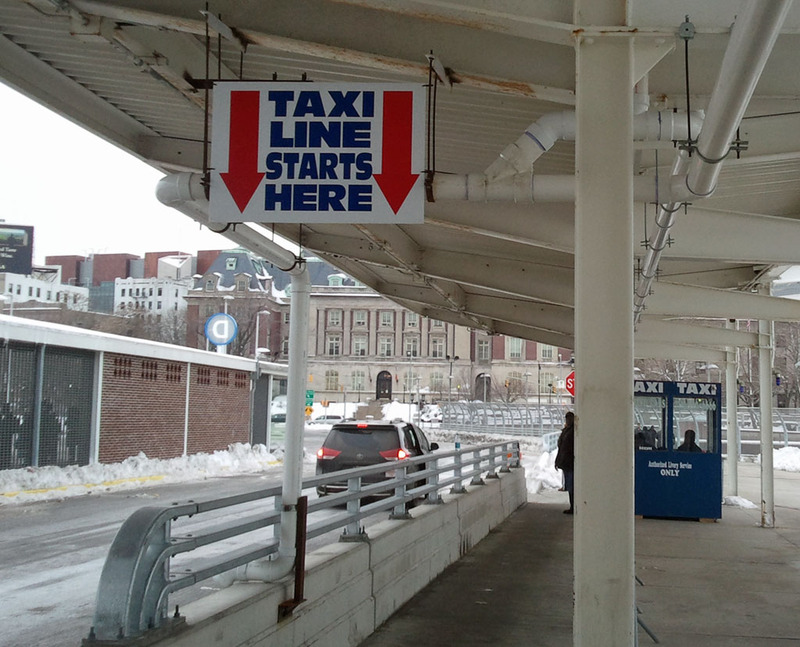 Join the taxi line at the blue taxi dispatchers booth. 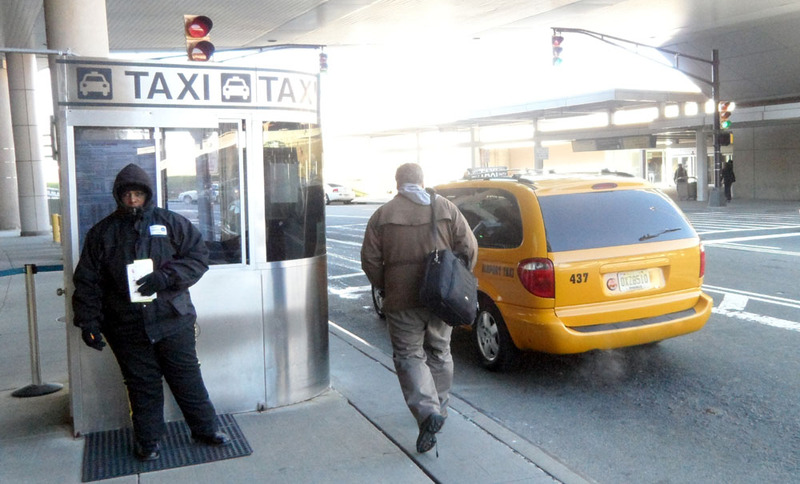 Note: These are local car service taxis, not New York City yellow cabs. Tell the dispatcher your destination - 141 St Marks Place. The dispatcher will quote you a price - probably $6. Get in the next available taxi. It is legal to ask you to share the taxi (you only pay for your own ride). It is also legal for you to require a ride without sharing. 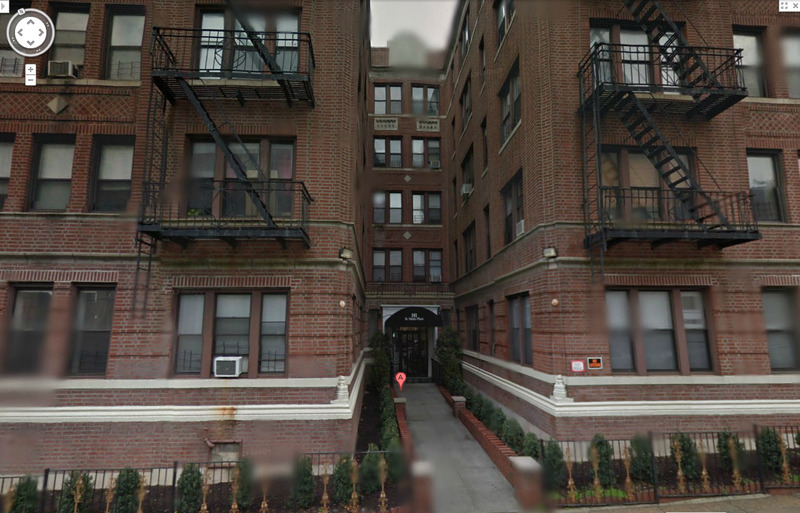 For a picture of my building, go to I: From St Marks Place at Hamilton Avenue. If you are happy with the taxi ride, pay the fare plus a 20% tip. on Ramp D (right red arrow). You will walk either left or right around the central waiting room, and then find yourself in a long hall with stairs down to trains and ramps up to buses. Along one side of this hall are ramps sloping up. These lead to bus platforms. 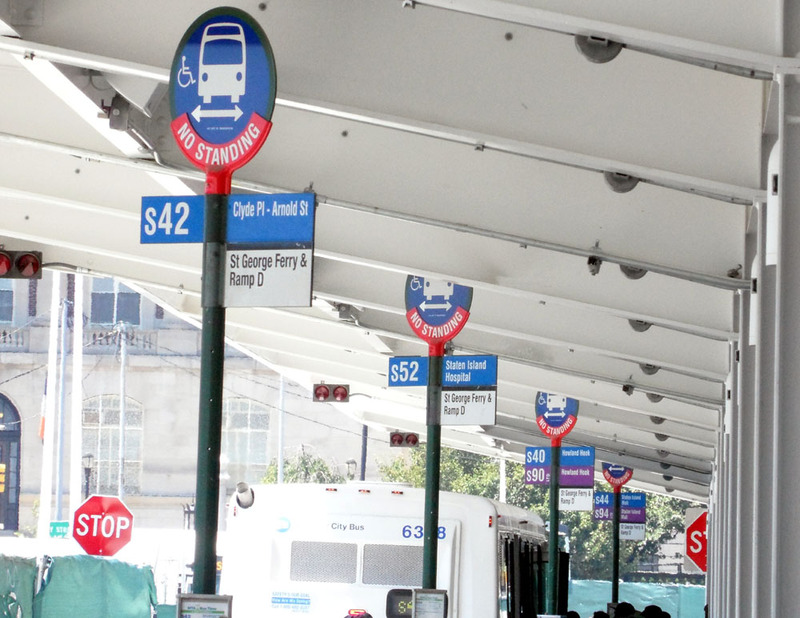 Find Bus Ramp D leading to the S42 and S52 bus. Climb Ramp D and walk along the Bus Platform. Wait for the S42 or the S52 bus bus at the near end of the Bus Platform. Take it when it comes. One or both buses meet every ferry except between 1:30 a.m. and 5 a.m. on weekdays and between midnight and 5 a.m. on weekends. 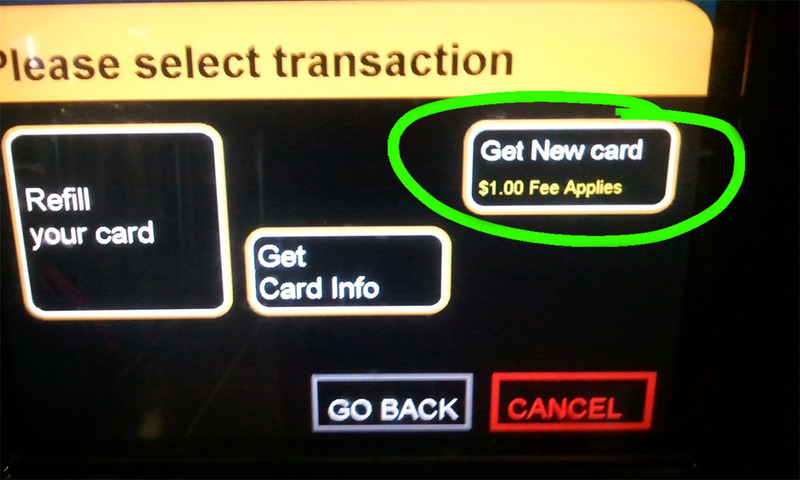 Pay with your MetroCard (the transfer will be free if you already took a subway or bus on the other side). Counting the Ferry terminal as the first stop, get off at the 8th stop, at the corner of St Marks Place and Nicholas Street. The bus stops in front of my door. The bus only stops on request when someone signals NEXT STOP (cord or button or strip). The bus will skip the stop if nobody signals. The bus first winds around many corners to the top of the hill, then runs along St Marks Place. 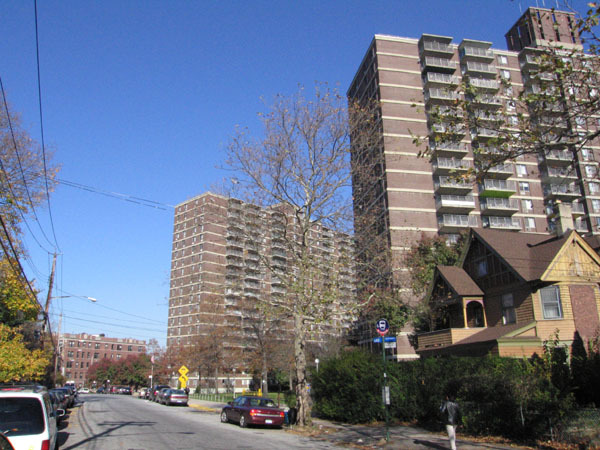 After 3 blocks, it passes two 20-story Castleton Tower apartment buildings on the right. Get off at the next stop. 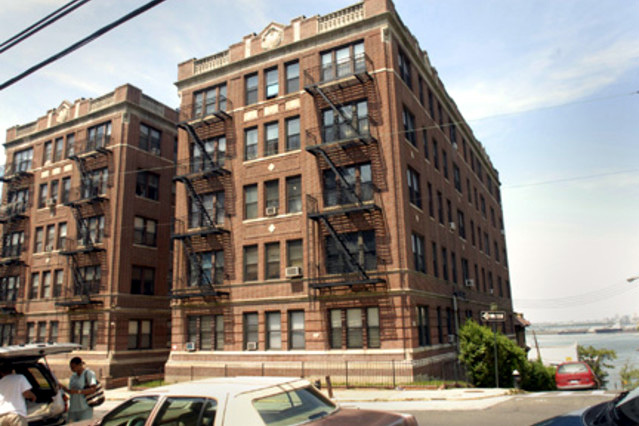 For a picture of the Castleton Tower apartment buildings, go to I: From St Marks Place at Hamilton Avenue. Wheel your bicycle off the ferry on the lower level. Ride up the ramp to the street (Richmond Terrace). Go to H: From Richmond Terrace near the Ferry Terminal. Look for stairs and an elevator going up to the street, Richmond Terrace, opposite you or slightly to the right. Go up these stairs or elevator. ... And out to the street (Richmond Terrace). You are on Richmond Terrace near the Ferry Terminal, with the harbor on your right. Take the third left, second traffic light, past the police precinct on the left and the ballpark on the right, Hamilton Avenue. Walk to the top of the hill (3 blocks) to the stop sign. This is St Marks Place. Turn right. 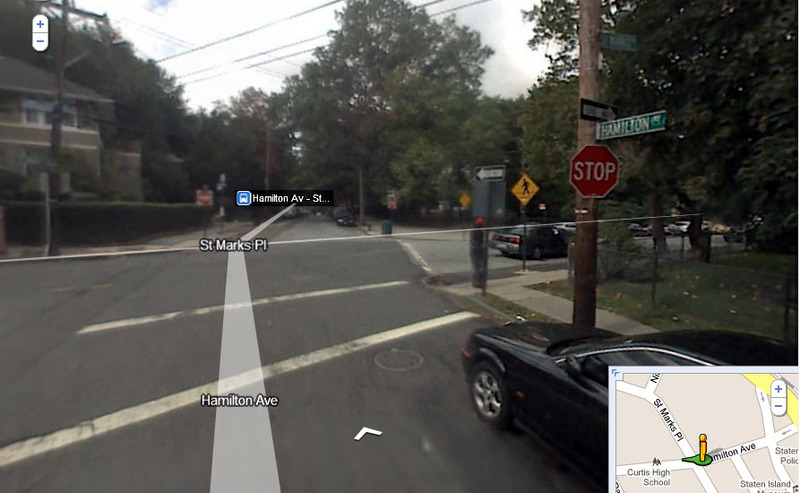 Now go to I: From St Marks Place at Hamilton Avenue . Go one block past two 20-story Castleton Tower apartment buildings on the right. My building is the smaller building beyond them. Continue to the intersection of St Marks Place and Nicholas Street. 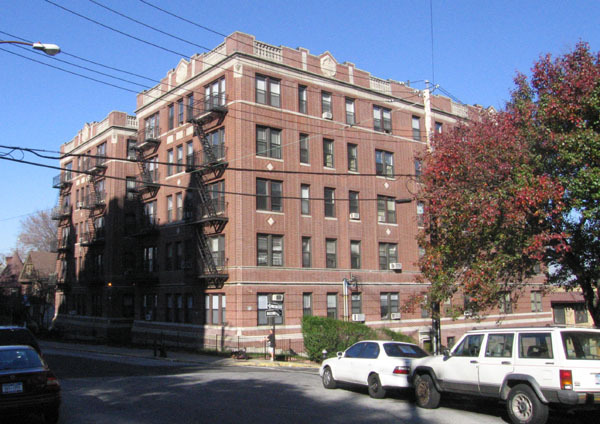 My building is the old 5-story apartment building on the right. Free on-street parking (watch the parking signs). I am in 5-F (fifth floor).